We saw how, for your business to be profitable, your team should be customer-centric and for your team be customer-centric, your tech should be digital-centric. But powerful as they seem to be in themselves, it isn't enough to complete the digital puzzle. 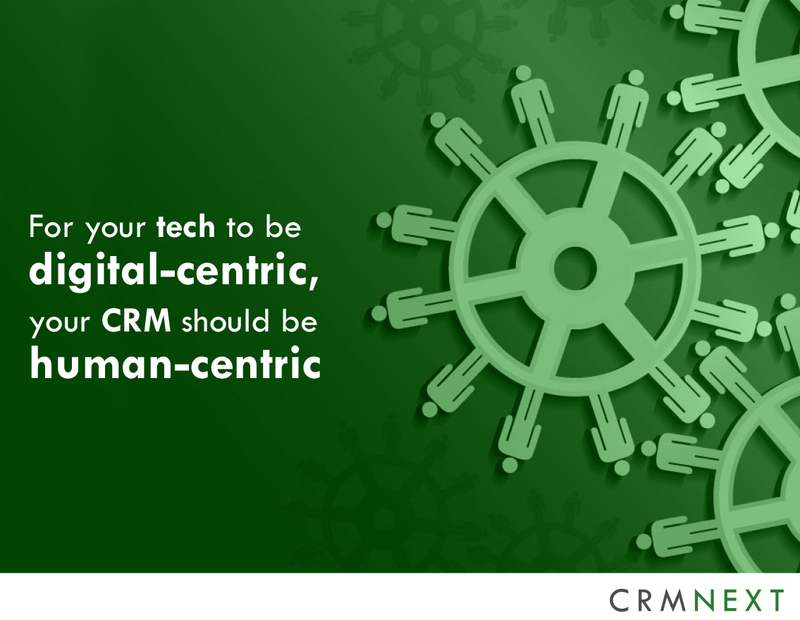 Because in the end, For your tech to be digital-centric, your CRM should be human-centric. As mentioned in our earlier posts, customer delights are critical for business success today. And customers are humans, so are your team members serving them as Relationship Managers. Ergo, the need for a human centric CRM for your business. Any Digital CRM solution worth its salt has to ensure that the right user experience is available so it won’t be hard to operate in any given scenario. For starters, a human centric Digital CRM can help a business stay flexible and adaptable to more agile business processes. Automatic updates with no human intervention or downtime is a given. In the meantime, your Work force can also update processes based on the events that may occur at any given time. Digital and human centric CRM are not separate entities but rather a powerful single tool delighting customers and finding new avenues of business growth. But more than technical jargon, human centric CRM is a series of new processes that are created by the customer, for the customer. Does the mean that you need huge investments to create a human centric CRM? No. Develop one by asking the right questions, investing the ground realities of your business-customer relationship (stress on your), developing a comprehensive testing cycle, creating a personalized interaction interface, focusing on great after sales services, nurturing the customer to gain lifetime value etc. Guess who can help you do all this and that too for FREE? Your latest workforce member, the chap who’s now deciding your business process reinvention – your customer! Now, all you have to do let him/ her suggest your process innovation and let your web-interface project this for customer-use. In such an“out-side in” innovative environment, all you need is an interface Designer that’s built into your CRM. Then you can dynamically alter your websites, self-service portals, apps etc, and your customer will actually think and feel that HE/ SHE was responsible for this change.With such a sense of ownership/ stakeholdership, such customers become blockbuster accounts that self-serve your business. You can just stand by the side and smile a deeply ‘Digital-CRM’ smile of satisfaction . A human-centric CRM consists of feedback-based features, where people can send comments about their particular experiences and the business can then respond to the requirements that the people have illustrated. When used right, it can make it easier for a business to respond and be aware of what it can do to improve functions. Life of both the customers and your workforce becomes simplified with human centric Digital CRM.